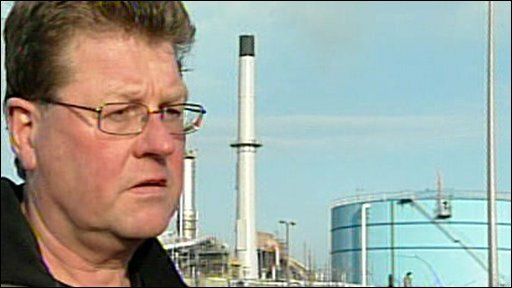 Unions will recommend workers at Lindsey Oil Refinery in Lincolnshire go back to work, after an improved offer on use of foreign labour was proposed. The deal, arising out of Acas talks, offers more than 100 new jobs for British workers out of a disputed 195. The BBC understands no foreign workers will lose their posts as a result of the dispute at Total's oil refinery. A proposal to offer 60 jobs to UK workers was earlier rejected, but Acas said it was never an official offer. Negotiations have been going on since Monday. On Wednesday morning protesters again gathered at Total's site, in North Killingholme, where the current row erupted a week ago. Since then thousands of workers at more than 20 sites in England, Scotland, Wales and Northern Ireland have taken part in sympathy walkouts and protests. Tony Ryan, from the strike committee, told the Lindsey workers on Wednesday that union officials still had issues to discuss before the deal was finalised. "We've made significant progress," Mr Ryan said. "The stewards' recommendation tomorrow will be for the lads to return to work." Acas said that a recommendation for 101 new jobs for a defined period was to be put to a mass workers' meeting on Thursday. A statement issued by Total UK said it had agreed with Union officials to not present details of the proposed agreement until after the meeting. It added: "We would like to highlight again that we have not, and will not, discriminate against British companies and British workers. "We would like to thank Acas for its involvement in the talks and in helping us to reach a resolution." And Bernard McAulay, national official for the Unite union, said he believed the deal would mean 102 new jobs for British workers only. These will be recruited immediately for the project, which is due to last until 31 May 2009 and will be a mix of skilled and unskilled posts, he said. Mr McAulay also praised the police, who he said attended the protests at the Lindsey refinery every day - including in heavy snowstorms. "I would like to give credit to the police who have been fantastic. Everything has gone extremely well." BBC correspondent Danny Savage said a deal that had put foreign workers out of a job "would have led to a huge row about protectionism". Gordon Brown, speaking at prime minister's question time, said new guidelines had been issued to try and prevent such a dispute from occurring again. "The Construction and Engineering Association have issued new guiding principles for companies - principles to consider when using non-UK contractors and labour on engineering construction sites. "I hope the whole House will welcome the fact that they now say, in their new advice, always consider whether there are competent workers available locally. "If there are it is good practice for the non-UK contractor to explore and consider the local skills availability and to consider any applications that may be forthcoming." Workers have been angry that a sub-contractor was "excluding" British workers by importing a ready-made workforce from Europe. 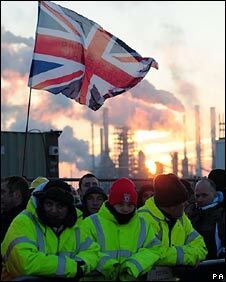 The suggested solution to give some of the jobs to Britons came after two days of talks between unions and the refinery owner, Total. On Wednesday morning, workers heard a proposed deal would see 40 skilled and 20 unskilled jobs being made available to the British workforce. But our correspondent said they believed the figure was too low, and rejected the deal. They also demanded proof that the foreign workers being brought in were on the same pay and terms and conditions as their British counterparts. Total has consistently claimed this is the case, but local workers do not believe it, Danny Savage added. Unemployed workers and contractors in oil refineries, power stations and nuclear plants have been taking part in protests since last week. Union activists have said the issue has been simmering in the industry for years, with British workers being excluded from applying for some jobs. Work to expand the refinery was sub-contracted by Total's main contractor - engineering firm Jacobs - to an Italian company, IREM, which decided to use its own foreign workforce. Total insisted it was not discriminating against British workers and that the decision to award the contract was fair. Unite shop steward Kenny Ward said workers were "determined to achieve a victory at Lindsey because this is where the fight started". He said people had had enough of employers using "unjust laws" to "pitch one European worker against fellow European workers" in the pursuit of profit. Derek Simpson, joint general secretary of Unite, told BBC Breakfast that besides this dispute there was a "wider problem" to address. "Even if this dispute is settled [there is] still a major problem about how these foreign companies, who win contracts and come complete with a workforce, are going to create other difficulties. "We need to build in some sort of concept that the jobs that are created by these contracts are open to everyone - to foreign and to UK workers. "It will occur again, and I'm sure it will occur in other countries as well unless there's a realisation that you can't just use the freedom of labour to the exclusion of indigenous labour." Protesters have vehemently denied the issue is about racism against the foreign workers themselves. The CBI has backed Total, while Business Secretary Lord Mandelson has said the country should focus on the economics of the recession, not on "the politics of xenophobia".